Update: it moved to a new location on Western and 1st. A LOT bigger but not sure if it has retained its taste. I'm going to kick off the year with one of my favorite Korean BBQ places that also happens to be one of the best deals in town -- Shik Do Rak. This is no ordinary Korean BBQ, however. It's one of those ingenious inventions that could only have been conceived in a place like LA. 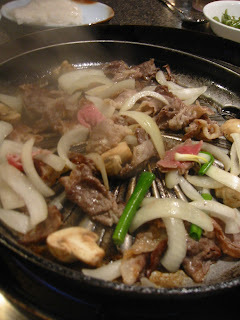 Thin slices of chadol, or beef cooked tableside, but not with the usual condiments you would see at a regular Korean BBQ place that serves marinated ribs and the classic bulgoki. In addition to the usual banchan (side dishes) spread of kimchi, braised potato, pickled cucumber, seaweed and spicy and sweet strips of radish, you get a stack of super-thin rice cakes slightly bigger than your average business card. Instead of a heaping plate of lettuce, kennip (sesame leaves) and ssamjang, the chili and bean curd paste you add to the lettuce wraps of kalbi or bulgoki, you get a bowl of finely chopped lettuce mixed with strips of raw green onions. 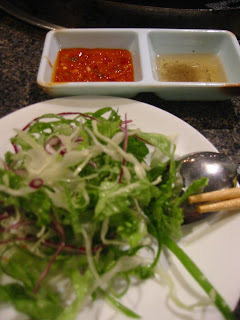 As condiments, you get two dipping sauces of sesame oil, salt and pepper and a spicy red sauce that seems to have originated from the Vietnamese sriracha sauce. I am a huge fan of the classic Korean BBQ meats and condiments, but this was a revelation when I first had it. A ttukbossam lover was born. Shik Do Rak claims credit for inventing what literally translates to "rice cake (ttuk) wraps (bossam)." This is how it works. It's best to ignore most everything else on the menu except the page where the combination deals are listed. The first one listed feeds 3 (or a very hungry twosome) and for something like $29.99, you get a lot of meat, onions and mushroom accompanied by an unlimited supply of rice cake wraps, greens and side dishes. The pricier ones feed more people and include drinks and other types of meat such as pork belly, but as much as I like pork, I stick to beef here. 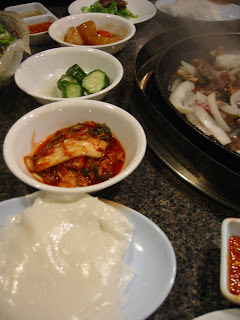 Koreans always like to eat a "real meal" after BBQ meats, so the combination deal includes a bubbling pot of duenjangchige, a delightfully salty and slightly spicy fermented soybean paste stew with veggies and a choice of rice or nuroongji, toasted rice porridge that is the ultimate comfort food. The tastiest way to eat these wraps is dip the cooked meat in the sesame oil sauce and lay the meat on a bed of green onions and lettuce on your plate. Spoon on some of the red sauce onto the meat, carefully peel off a slice of rice cake wrapper and use your chopsticks to scoop the meat dipped in sesame sauce and greens, topped with the red sauce. It's heaven on a stick, or two sticks, I should say. At once you taste the seared meat with a hint of sesame oil, salt and pepper, and the refreshing crunchiness of the greens with a kick from the red sauce -- topped with the neutral and slightly chewy white rice cake wrap. It's a full meal in one bite -- and a pretty darn satisfying one at that. You simply have to taste it to believe it. Even though the post-meat stew isn't the star here, you can't help but finish it despite the fact that you have long exceeded the healthy 80% full mark. It's comforting, salty and goes so well with that rice or rice porridge that reminds you of how your mother used to make it at the end of every meal (the porridge is meant to help digestion although in this case it may have the opposite effect). Now for the side dishes. 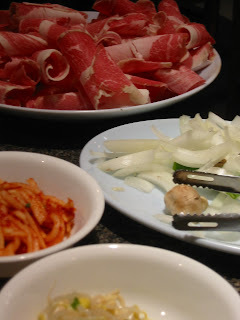 My favorites are the pickled cucumber because it's refreshing and crunchy without being too sweet or vinegary; sweet and spicy radish strips because they also add a crunch, freshness and spiciness; and kongnamul, a bean sprout variation lightly seasoned in salt, garlic and sesame oil, for its mild and nutty taste. I will say that the cabbage kimchi tastes like the raw kind they haven't fermented for as long as the usual ones. Raw is fine. I just don't like this version that much. While I'm at it, I may as well lay it all out. Shik Do Rak should really add to the array of accompaniments large, round slices of pickled radishes. Its biggest competitor in Garden Grove, Morangak, offers these full moon-sized radishes that add a whole other dimension to the rice wraps. If I feel like I've had one too many rice wraps, I forgo them and opt for the bun-less burger equivalent -- ttuk-less ttukbossam. The round slices of radishes could also stand in for wraps. The beauty of ttukbossam is that just like with Korean BBQ, you can pretty much custom-make every single wrap to your liking. Some people like to throw in some raw or cooked garlic. Others like to add some kimchi. I happen to be a purist but anyone is welcome to try different variations. I'm glad to see many non-Koreans frequenting Shik Do Rak these days but the place remains largely a Korean haunt and those who have Korean friends who either take them there or tell them about it. I really wish it broke into the "mainstream" so many more people could enjoy it. That's my goal -- to spread the word about this gem. By the way, I think I saw a "B" sign last time I went, so for the faint of heart and those who like clean surroundings, this may not be the place for you. Parking is valet but if you come after 7pm, there is free parking right in front of the restaurant on the street. On weekends, it gets crowded and you may have to valet park, especially because it's not considered the safest neighborhood and you don't want to wander around looking for a great spot and walk too far. Also, the rice porridge is only offered for dinner as is the braised potato side dish. Interesting factoid: despite the fact that I go there almost every other week, the friendly manager never recognizes me but ALWAYS remembers my eating companion Omurice who comes as frequently as I do. We always test him by having me walk in first, but alas, he doesn't break into his signature "Oh! Hello!" until he sees Omurice walking in right behind me. What's up with that? Omurice, this post is for you! AVOID: many impostors have popped up since ttukbossam's popularity but none come close so do avoid those. They include Hangyang on 8th near Hobart, Castle on Western and many others. Morangak in Garden Grove I like (the round radishes, remember?). Many butcher shops and markets in Koreatown also sell the raw materials to make it at home. I have yet to experiment so will let you know how that goes. 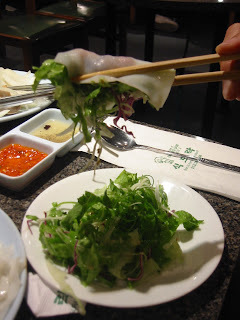 that mix of juicy meat, fresh greens, sesame oil, and spicy red pepper sauce, all wrapped in slightly sticky rice paper makes shik do rak one of my all time favorite comfort foods, guaranteed to make you feel good (and full). thanks for the shoutout nj. I've brought several guests here and, so long as the person likes meat, it's always gone over well. This place rocks. Definitely up there on the list of things we miss about L.A.
One of my favorite restaurants in L.A. Yummm...so when are we going for lunch (or after-work dinner) with the Round-the-World dining club?